The Improbable positivity of the Peppard woman. It was only when my divorce was finalized that my older sister lost her nerve. She rang my mother in panic to inform her that I was about to have a nervous breakdown. ‘Nonsense’ my mother retorted ‘Peppard women don’t have nervous breakdowns. I may have been elated with the relief that it was over but I definitely wasn’t having or even contemplating having one. Our sisterly friendships are strong and though often interspersed with squabbling, forming opposing groups, reconciling again, we support each other unconditionally when trouble occurs. We are also hugely loyal and would certainly never speak ill of each other in public. Therefore, when I attended a writers group and was told that, if I had to be careful of what I wrote for fear of offending my family I may as well not bother writing, I voiced my concern. Such concern, my teacher replied, Will only make you selfconcious and spoil your spontaneity. As long as you don’t say libless things about any of them you should just tap away. And if a family member disagrees with the happenings of an incident you have written about just remind them it was written from your memory of the incident. So with bated breath and a nervous sense of permission I write the following piece. Stoicism is an ancient philosophy, a school of thought which feels that if you push emotion to the side then you can deal with things in a more rational clear headed way. The modern version of the word is used to describe people who endure without complaint, people who are forbearing, resigned, fortuitous and most importantly, people who do not have nervous breakdowns. It would be a word that comes to mind if I was ever asked to describe the women of my family and I believe it stemmed from when we were little. 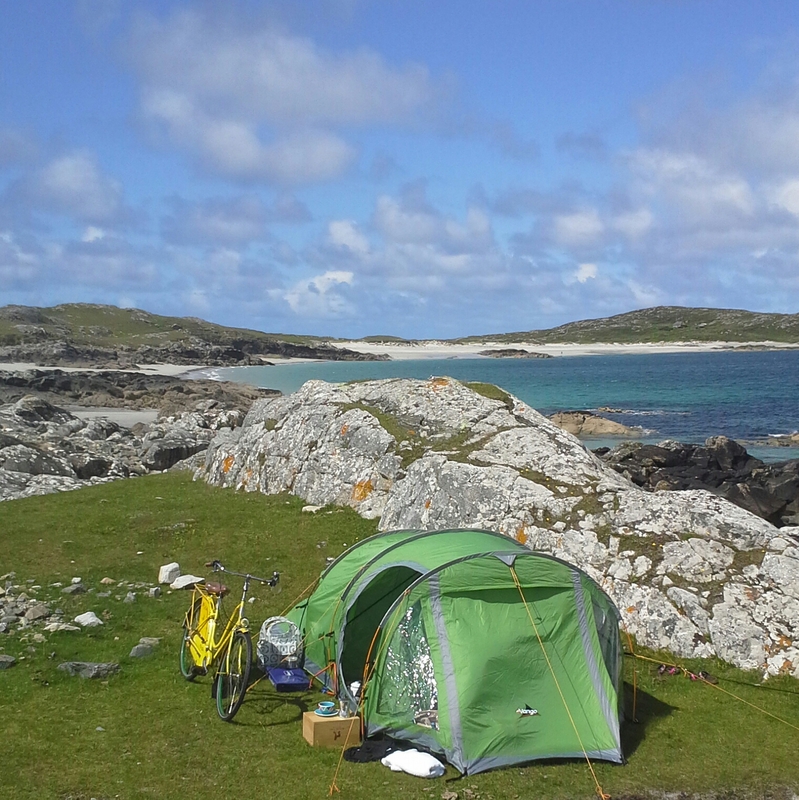 Every summer for as far back as I can remember, my parents took us what is popularly known now as, wild camping or even more recently, stealth camping. They were not trying to be cool or different! It was just that they loved the wilds and camping and, as there was enough of us, we had no need to seek the company of others, so that’s what we did. 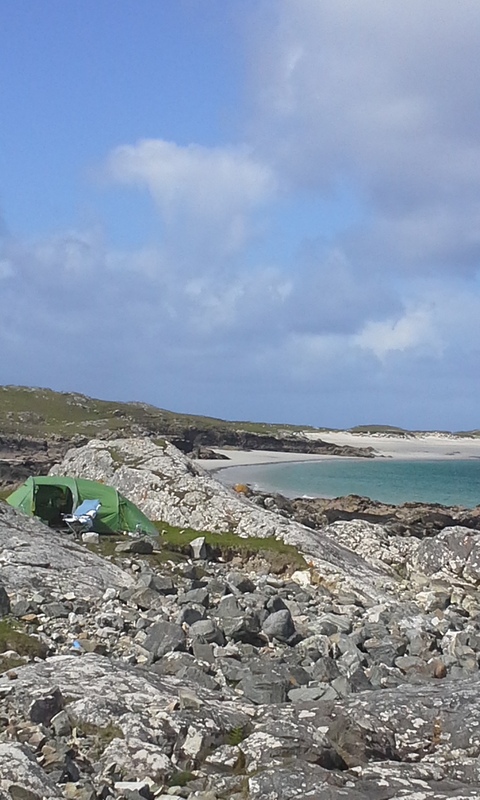 Mostly we camped along by the sea on pieces of common land where the beaches stretched for miles and where there wasn’t another sinner in sight. But the odd time, if my dad felt that the look of a lake or a river showed promise of good fishing, we would set up camp in such a place. Being respectful of ownership and never presuming his right to plonk himself (and us) down wherever he fancied, he would always get permission first from the nearest farm house and was never denied it. In fact we made some lifelong friends this way and each Christmas we addressed cards to faraway places with names that sounded songlike. Inishmicatreer, Inchigeelagh, Gougane barra, Creeslough. Looking back I’m sure these farmers could never understand why a Dublin man (An architect with a grand car at that) would haul his wife and eight children across fields and set up camp beside the lake. That while they, not by choice, were without car and had no indoor plumbing, this man would send his children with a bucket to get water from the pump and expect his wife to feed her family from a tiny stove in a caravan, when they suspected he had a perfectly well built house back in the suburbs complete with toilet and bathroom. But they held their council and their wives sold my mother fresh milk and eggs, and buttermilk to bake brown bread in her tiny oven (my dad refused to eat shop bought bread). And the women, when they had a chance, would slip down across the fields, and have tea with my mother. Sitting out in the sun on camping stools they would chat and compare notes about children, and housework and the difference of their lifestyles and I know my mother welcomed these interludes as a break from preparing and cooking of endless meals for her energetic family. And while they talked and their husbands cut the meadows and my dad fished, we found adventure in everything even our most mundane of chores . I remember the farm at lough Acalla, where we would be sent to collect the milk and eggs. It was one of our more exciting jobs as it contained an element of danger. Peering over the gate we needed to check first and see if the pigs, a huge sow and boar were asleep. If they were then we would ‘run the gauntlet’ hoping to make it to the backdoor in one journey. More often than not they would wake and come lumbering angrily towards us and we would have to scale the giant haystack in the barn (the halfway point) and sit there patiently till they fell asleep again before running the rest of the way. It was the same on the return journey but miraculously we never lost an egg or spilled the milk and always arrived home unscathed. It didn’t occur to us to mention the cross pigs to our mother and therefore she was probably unaware of the risk it involved. We presumed, seeing as we were allowed to row boats around the lake without wearing life jackets and never had to say where we were going when we went exploring, such incidences wouldn’t concern her. Once a fisherman placing oars in the rowlocks of his boat watched us arrive and set up camp. He gave an account of it later, describing it as an exercise run with military precision. He told of how, when the entourage pulled up, children of all sizes and ages tumbled higgledy piggeldy out of the car, righted themselves and with no apparent orders got to work. The tallest tugged two large containers from the car boot (out of which clambered two more children) and set off in search of water. The second tallest proceeded to unhitch the caravan from the towbar and with her father swung it into a suitable position. She then jumped in through the caravan door before reappearing with a winder and proceeded to wind down the four legs. The third tallest (me) gathered the remaining children and herded them down to the lakeshore where she kept them out of the way, passing the time by examining small beetles and water skaters. The father unloaded his fishing gear, (Hardy rod, fishing creel, waders) and carried them down to the boat. Meanwhile glimpses of the mother could be seen through the curtains organizing the interior. At this stage, and with no sign of being called, the children, herded back from the shore, were lined up in a row and as various pieces of camping equipment, chairs, basins buckets and spades were passed out through the door by the mother, they stowed them neatly under the caravan. A few minutes later the tallest girl reappeared, this time walking slowly with her burden. Stopping now and again she carefully placed the two heavy cans on the ground and rested her arms. The second tallest seeing her struggle ran to help her. A short while later the air was filled with the glorious smell of fried meat and onions at which point the father, having bailed out the boat, fitted the rowlocks and slotted in the oars, came back up to have his dinner before heading off again for the four o clock rise. Sometimes the menagerie contained not only children but dogs, cats and even once my pet black mice. Back at school I would compare notes with my friends and as they recounted apartment holidays in sunny spain I would feel so sorry for them. Where was the fun in that I wondered but I kept my thoughts to myself. Last summer once again I found myself hanging onto the guy ropes of someone’s tent. This time it was my youngest sisters (she was belting the storm pegs into the ground). We carried on a normal conversation, the rain and wind whipping our hair about our faces. Now and then she would stop hammering and lift her head to check that the three small figures running in and out of the waves were not being washed out to sea. I had been here a week before her and the weather had been glorious, but high winds and rain were promised for the weekend. 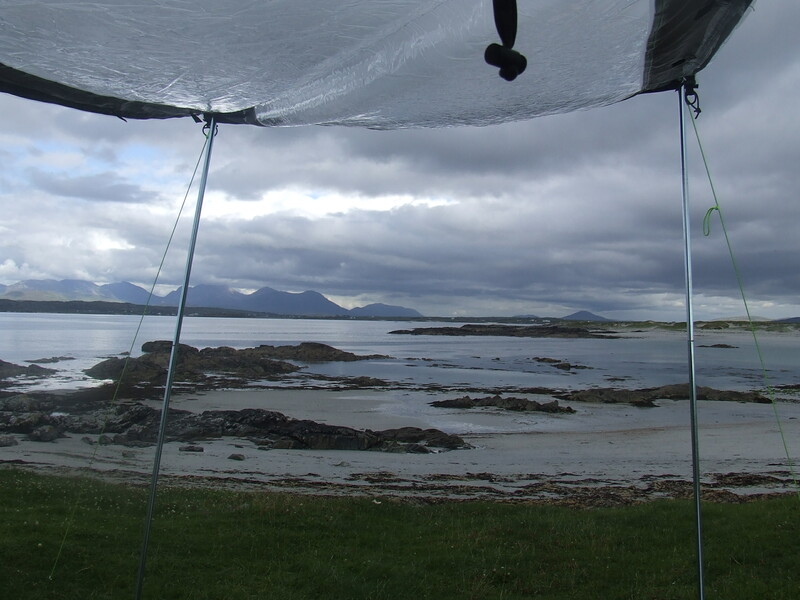 Yet here she was unpacking bedding, unloading boxes of food, crouching to fill a saucepan with water, placing it on all the small stove as the wind dipped the tent inwards, emptying a packet of pasta into the boiling water. The children could now be seen running back up across the sand. Their heads low as they struggled against the elements, their childish voices snatched away in the storm. Their trousers wet to their knees. I looked at her bent head as she grated parmesan onto the cooked pasta. ‘Did you check the weather forecast before you set out? ‘ I asked her. When we were children, before he set out on a day’s fishing, my dad would lift the phone and dial the number of met eireann. Listening intently to the recorded message he would frown crossly and slamming the receiver back into the cradle would announce ‘Nonsense, load of rubbish’ before storming towards the door with his waders looped over his arm, his fishing creel across his shoulder and his hardy rods in his other hand. ‘If you were to worry about the weather forecast in this country’ he would call back to us ‘you would never go anywhere’. Last week I was chatting to a friend who had just come back from a visit to Groningen (A university town in the north of Holland). 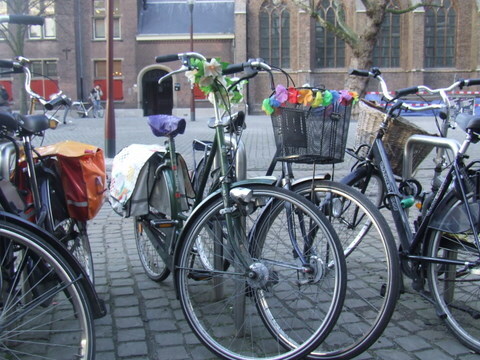 ‘I mean of course CYCLING around on them.’ He Laughed, correcting himself. But his description made sense. When I think about it, running around on bikes is exactly what I do. When I’m not flying about that is. Or even scooting about! Now Einstein once said ‘Logic will get you from A to B but imagination will get you everywhere’. He didn’t mean it literally but I will take it so because I never seem to cycle straight from A to B.
I may intend to head directly home but am often drawn to interesting side roads especially those where I can’t see what’s around the corner. Imagination gets me everywhere when I’m running around on my bicycle! AND when I do run, fly or scoot to the shops, don’t expect me back for some time. 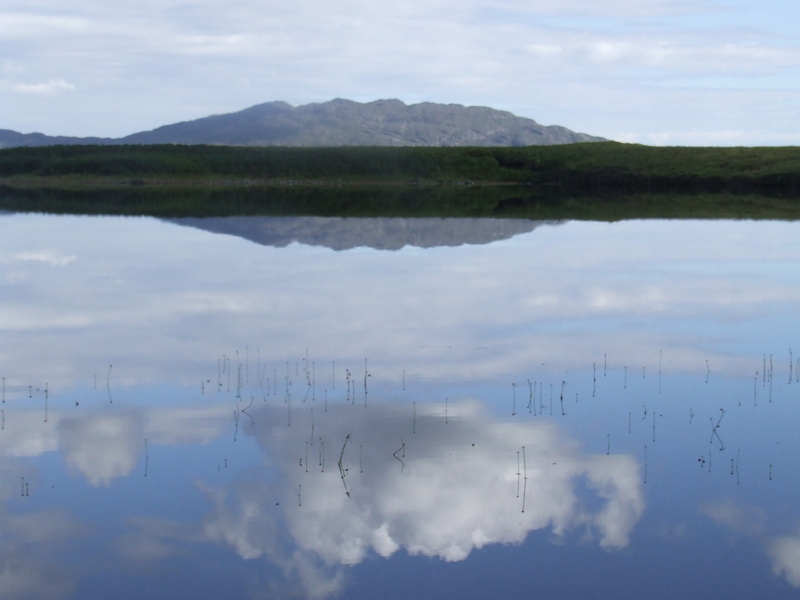 For many years my extended family (brothers, sisters, in laws, children, nieces, nephews, grandchildren) go on an annual camping trip to connemara. It’s a Tradition. A sort of gathering of the clans. I call it the trip to our summer hunting grounds. A wild and barren place without a tree or bush for shelter. The grass, short and undulating, forms hollows here and there and it is in these hollows we peg down our tents hoping to gain refuge from the prevailing north westerlies. It is also these Hollows we squabble over, as some are more favored than others. Those having easier access to the strand are in high demand for family members with young children. Those more off the beaten track are the ones looked for by the quieter members . Some nearer to the spring well are for the laziest of us. 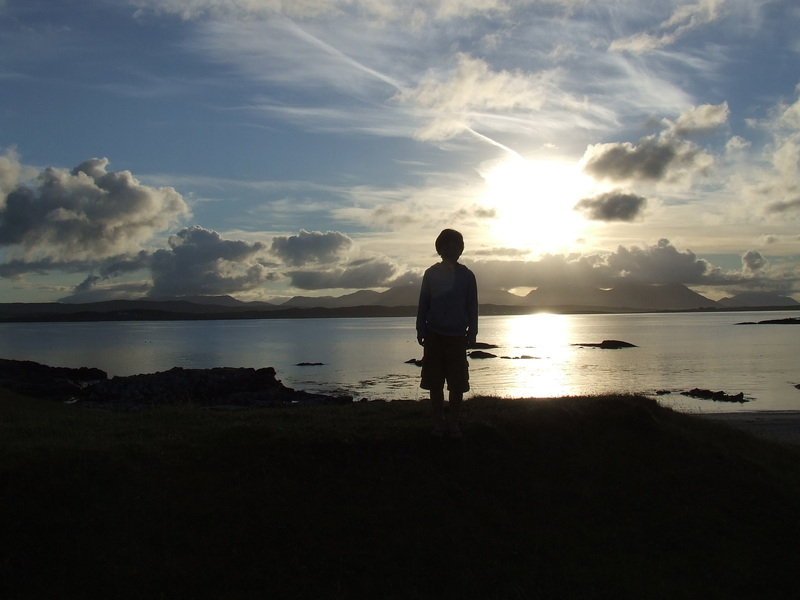 But all have views of the sea. Over the years they have gained names. Big hollow. Shallow hollow. River hollow. Stephs hollow. Mels hollow. First beach hollow. Far beach hollow. It is sort of a first come first served basis and there maybe a day or two of frigid coolness towards the one who took the hollow you were planning to inhabit only they got there before you. But after a while we settle down and return to our normal family friendliness, joining each other for early swims and visiting each others hollows for coffees and chats. If you join us be prepared ! There is a large lack of privacy and not much time for solitude, even though our place of camping is remote. We often eat our evening meal enmass. Each camp bringing their contribution. On the day in question (The Einstein day) it was my brother’s turn to host the occasion. As, for once, it was a relatively calm day, He decided a barbeque would be a good idea. 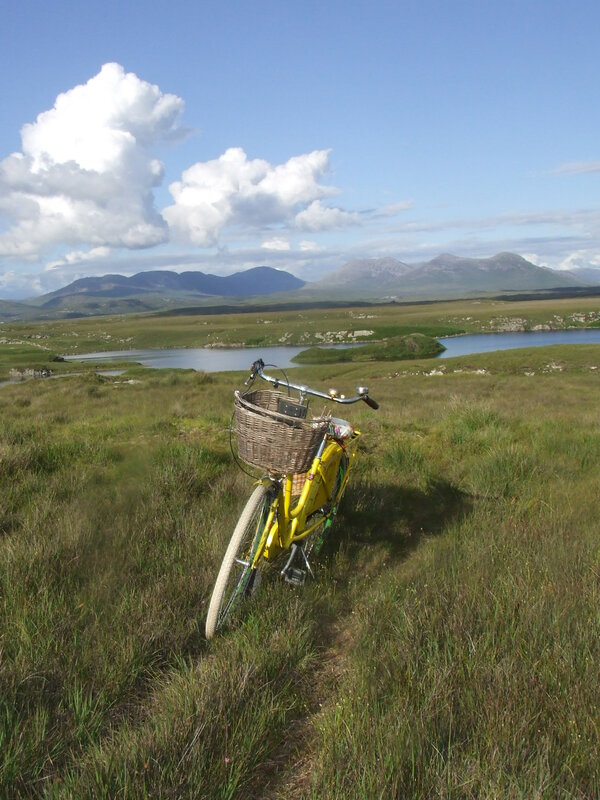 So in the early afternoon I ran (cycled) into clifden to the butcher to get our contribution. My shopping completed with plenty of time to spare, I branched off at Ballinaboy bridge and taking the first turn right I cycled down a boreen which had aroused my curiosity before but I had yet to explore. ‘Just see where it brings me’ my imaginative brain instructed. ‘It may well join up with the main road further along’. I cycled along the gravel swerving now and then to avoid the potholes. A line of grass appeared, thin at first but getting wider the further I went, until there was more grass than gravel. The hazel and alder hedges on either side thickened and became alive with birdlife. Tiny stonechats and finches chastising me. The road must have twisted slowly and, unknowingly to me, southeastwards because suddenly the sun, which had been warming my left shoulder, was now doing the same to my back. Around the next corner a lake appeared and the road came to an end in a swirl of uneven gravel at its rocky shore. I stopped to admire the stillness of the water. A small track led to the right of the lake. Made by sheep or man, I didn’t care. Without thinking I pushed my bike along it. At one stage I nearly lost a sandal, at another I had to lift my bike across a drain. My logical brain told me I was mad, the track was obviously going nowhere and I should give up and turn back! My imaginative brain told me this was exciting and to keep going. Without thought for the steaks in my panniers which were probably by now cooking in their own juices, I listened to the latter. The track, hidden in places by overgrown heather, twisted uphill. It was heavy going and there was no opportunity to cycle. In fact the track was so narrow it was impossible for the yellow bicycle and I to fit side by side so I had to walk in the heather in order to push it along. I paused for breath and turning watched a heron fly across the lake far below and land awkwardly on a small island. With renewed determination I continued to push the bike upwards. Suddenly I was at the top of the hill. Here the heather gave way to sheep cropped grass and what looked like the remains of an old fort on the top . 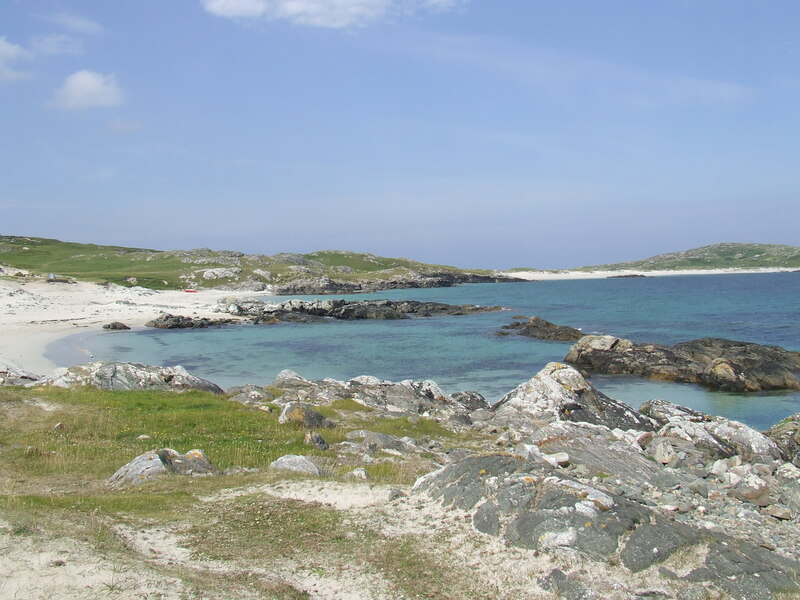 I could see why a fort would have been built here for sitting resting on one of its stones, the sea stretch out in front of me and away across, High island, inishturk and to the north west what looked like clare island lay calmly in the blue water. A fine lookout post this old stone circle was. But no time to linger. I followed the easier path down to the other side and there ahead I could see the alcock and brown memorial white and shining in the now dipping sun. A small track led me past it and I was back on a gravel road again this time without grass or hedging. Instead ricks of turf lined the one side of the boreen and small ponds filled with waterlilies reflected in the bracken water lined the other. The track opened out onto the main road. Ahead was my turn to the summer hunting grounds. I was nearly home. As I came across the beach I could make out a row of anxious faces looking at me from the brow of the hill in the evening sun. ‘ Mom what delayed you? You’re just in time! ‘Granny where WERE YOU? we’re STARVING ‘ Three small boys looked at me hungrily. ‘I have been on a magical journey’ I told them. ‘I’ll tell you about it at the fire’. We joined the rest of family members and looking like a tribe of ancient celts with our blankets (for sitting on) slung around our shoulders and our bags of food we hurried hungrily across the grass and over the hill in the direction of my brothers sheltered hollow. I took a discreet sniff of my bag of steaks before handing them over where they were placed alongside a plethora of different meats on the large grill. My daughters produced a saucepan of freshly picked mussels cleaned and ready for cooking. ‘Just in case you didn’t return with the shopping ‘ They explained ‘We didn’t want to arrive empty handed’. ‘Camping! 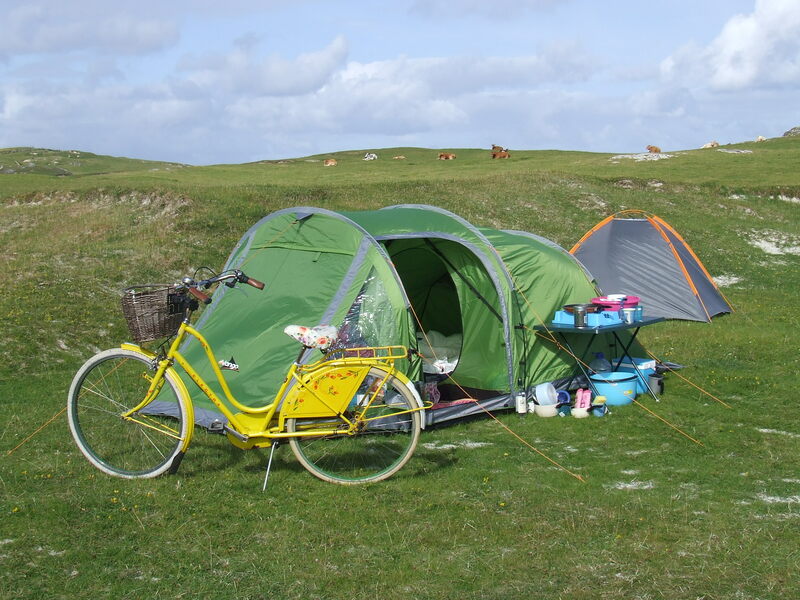 did someone mention Camping?’ asked the yellow bicycle excitedly. ‘Hurry up and get changed‘ my father instructs me ‘we’re almost ready to go’. We did not argue with my father so instead I look down sadly at my new white shoes and did as bid. Carefully removing my veil and struggling out of my white satin dress, I pulled on my shorts and T shirt and joined my siblings with the packing. I can’t remember if our camping trip for the week of the mayfly was to Lough Corrib or Lough Conn or Lough Mask but I do remember that it coincided with a day when I should have been (as I’m sure my classmates were) sitting in my communion finery in some posh hotel being admired by all and sundry. As I looked back at the white crumpled heap on the floor, a small part of me felt hard done by, but I had to admit I’d rather be on some lake shore where the reed warblers and stone chats and finches whisked in and out among the young willow and alder and where a great crested grebe bobbed on the choppy water and where we were free to take out a boat and row across to the different islands carrying small wooden boxes with mesh and a sliding door, rather like an old fashioned pencil case, to catch and put mayfly in and returning would stand at the gate and sell them to passing fishermen, whose waders made slapping sounds as they forded through the small streams that fed the lake and their heavy dapping rods caught and rustled in the branches of the willow and alder and where at night I would lie cosily among my siblings and listen to the tent flapping as the wind rose and after a while would hear the sound of my dad pulling the seventeen foot wooden clinker built lake boat up on the shore in the dark and where when I raised my head of my pillow I would catch a glimpse of my mothers face half lit by the lantern where she was lighting the bluey gas in the tent awning and putting on the kettle to make them both a cup of tea and eventually I would drift off to the sound of their murmurings as they discussed the happenings of the day and the loveliness of camping in the wilds. Why is it that some of us, who can well afford a hotel or a villa or even just a small cottage for our holidays choose instead to lie on the ground, in a sleeping bag, covered by a flimsy piece of tarpaulin in the middle of nowhere?. The ‘middle of nowhere’ bit is very important, for to camp side by side with hundreds of strangers in long straight lines or even in a dotted fashion of a camp site no matter how wonderful the view’s, is not what it’s about. I heard recently that a tribe consists of no more than eighty people. That eighty people is the largest amount we can sociably contend with (Which is why I am looking forward to my daughters wedding of just under that amount where out of interest we will be renting a beautiful villa complete with pool and not a tent) and that surrounding ourselves with any more than this number makes us uncomfortable and aggressive or defensive and certainly not sociable and may be the reason that we whilst we will greet a person we meet walking on a country road, we are reluctant to even make eye contact with another human on a city street. Is this where it all went wrong I wonder? Did what was suppose to be the civilizing of people become the opposite. And once we no longer had to gather together in a defensive group to ward off wild animals, did we begin to turn on each other instead? a sort of auto immunity of humans against humans in the same fashion that the body turns on itself in the case of an autoimmune disease. I have much pondered my love of wild solitudinal camping especially when, as I imagine others sipping gin and tonics in a glass with an umbrella on a white beach reclining on a sun lounger with the firm knowledge of retiring to an air conditioned room later where a vigorous shower and soft bed for the night is a surety, I am sitting huddled under canvas riding out a storm, or out hammering in storm pegs as the Northwest gale tried to blow me and my tent into the sea. I recently shared my pondering’s with a camping friend who came up with this. ‘Maybe deep down’ She said ‘there is a part of us , an ancient side that rejects consumerism, so every now and again we run away and camp to remind ourselves of the loveliness of living simply. A yearly event, a sort of pilgrimage. a trip to Mecca, Which we find ourselves planning for months in advance and if we don’t get a chance to part take of it on a yearly basis at least, we go into a decline’. Of course not everyone has this need within them. I have plenty of work colleagues who look at me in horror when we discuss our best holiday moments. Theirs being, lying on a lilo at some Italian lido while waiters in white shirts and khaki shorts, stand knee deep holding a tray of cold drinks at the ready……. 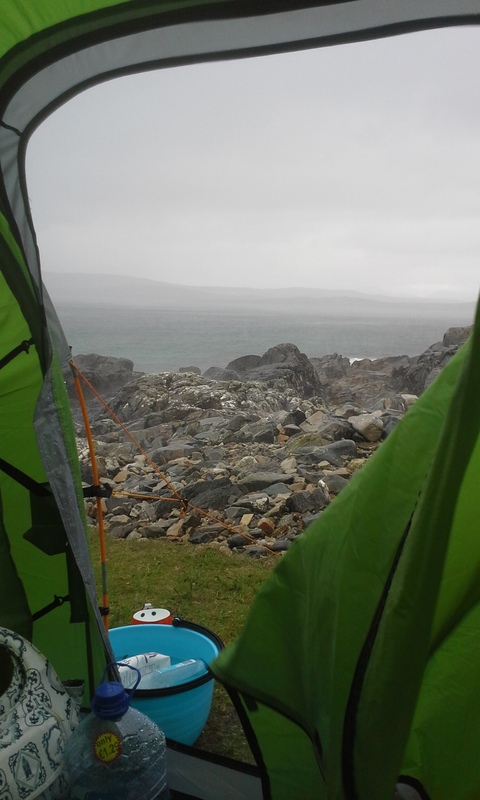 mine being, finding that perfect spot to pitch my tent then wander barefoot over grassy fields and down small sandy boreens to the waters edge where I watched the seals cavort. Sometimes these friends regard me with awe but mostly they think I am mad and beyond help. Whereas I think what I do is perfectly normal and presume everyone does the same. I should mention here there are ‘the middle people’. Those quite happy to do ‘canvas’ holidays where the tent is already set up with portable cooking facilities and beds up off the ground, and is one of a hundred tents stretching in a row as far as the eye can see. The only concession to pretending to be really camping is the fact you have to walk to the cement toilet block to wash. The fact that these camp sites are usually in a nice forest or lakeside setting does not fool me into considering this as ‘camping’. To me glamping has no right to consider itself true camping. Despite the wise words of my friend I think it is deeper than that. I think you have to be born to it, inherit it, have experienced it as a small child and have grown up with it and loved it. Interestingly, I met an old friend with whom I had studied midwifery with in Scotland where we had all shared a big old house with a large garden. She reminded me how, when we received our first pay package I went to the local camping shop and bought a tent and putting it up in the back garden, slept in it …..
At one of my sister’s wedding in Galway, we had booked en-mass into a lovely old country hotel (yes we are comfortable with the hotel thing too) My mom on receiving the key to her room, looked around at the squishy armchairs and sofa’s grouped cosily around a turf fire and remarked to the receptionist ‘Oh this is so lovely, we are more used to camping you know’. At which the receptionist replied ‘Oh are ye traveller’s’? My Mom was mortified, but maybe we are. Maybe she taught us to be. Maybe that’s why I camp! Maybe my going out is really going in, going home? Maybe like John Muir I am happiest when I am outside and when night falls there is only a sliver of tarpaulin separating me from nature. I know which I would choose without hesitation.